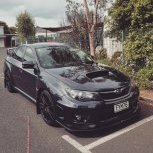 Hi, I've just bought my first Subaru. It's a 1999 Legacy B4 RSK, im pretty sure it's imported/jdm spec. I've noticed it's brakes are good but can be improved I was thinking about HEL braided brake lines all around and maybe sti brake calipers. Or is it even worth buying the sti calipers? I'm definitely investing in Bridgestone potenza RE003s all around. Thanks in advance, or any other mod suggestions are appreciated.